When I was 9, my grandparents & great grandparents took me on a roadtrip to California. It was just me & the four of them, cozied up in my Grandpa Sugar’s blue minivan. I had a library copy of “On the Banks of Plum Creek” on the seat beside me, Grandmas’ who had a seemingly endless supply of gum in their purses and Grandpas’ who would let me order steak for dinner. I was queen of the road for those two weeks and I loved it. We would stop here & there on our way down south; to play miniature golf or read a historical marker about the Oregon Trail. Yet no place held my Grandpa Sugar’s attention long enough to veer too far off course from his true destination, the Samoa Cookhouse near Eureka, CA. For days before we reached it, my Grandpa could talk of nothing else it seemed, until the cookhouse was built up in my mind as this mythical roadhouse full of the fluffiest bread on earth and never ending portions. When we finally did reach it, I ate so much of that infamous bread that I fell into a brief carb induced coma. It was some damn good bread indeed. Serving up one daily menu, family style, the Samoa Cookhouse is the last operating cookhouse in the West. Opened in 1890 as the Hammond Lumber Company Cookhouse, it kept the loggers fed with three square meals a day & prided itself on “never sending a man away hungry”. This philosopy still holds true today, so its always best to arrive with an empty belly & a voracious appetite. The cookhouse is not for those delicate eaters who boast about their not-so-special dietary restrictions of one kind or another. You get what’s on the daily menu be it pork chops, pot roast or fried chicken. Between the soup, salad, bread and side dishes though-one would be hard pressed not to find something to grub down on. And there’s always dessert. Adjacent to the dining room is a well stocked logging museum, packed with local logging artifacts and pictures. It’s a good place to stroll around after gourging on the lumberjack sized meal from next door. I remember the musuem being my Grandpa Jim’s favorite part of the Cookhouse, though my 9 year old self could only appreciate so much logging history before my eyes started to glass over. It was the entire experience though that I think made my grandparents love that place; from the family style comradery & the heaping portions, to the pure history of the place itself. I’ve never seen someone have a bad time there. Besides offering road weary travelers a place to eat, The Cookhouse serves up a chance to be a part of something, to feel what it must have been like to be a logger, a waitress, a cook when life was simpler but by no means easier. A world which my grandparents were familar with and which they tried to share with me all those years later. Today, three out of the four of them are gone but whenever I return to the Samoa Cookhouse; whether as a young college student, a newlywed or now as a mom, I remember that trip & I feel the memories of my time with my grandparents flood back to me. Now it’s my turn to pass on a little bit of history, to show to my sons that era in time which defined my grandparents generation and to share with them some of the fluffiest damn fine bread around. I had a disastrously bad relationship in my early 20’s and as hellish as it was at least two good things came out of it; my hard earned resolve to demand better for myself and a newfound love for pupusas. 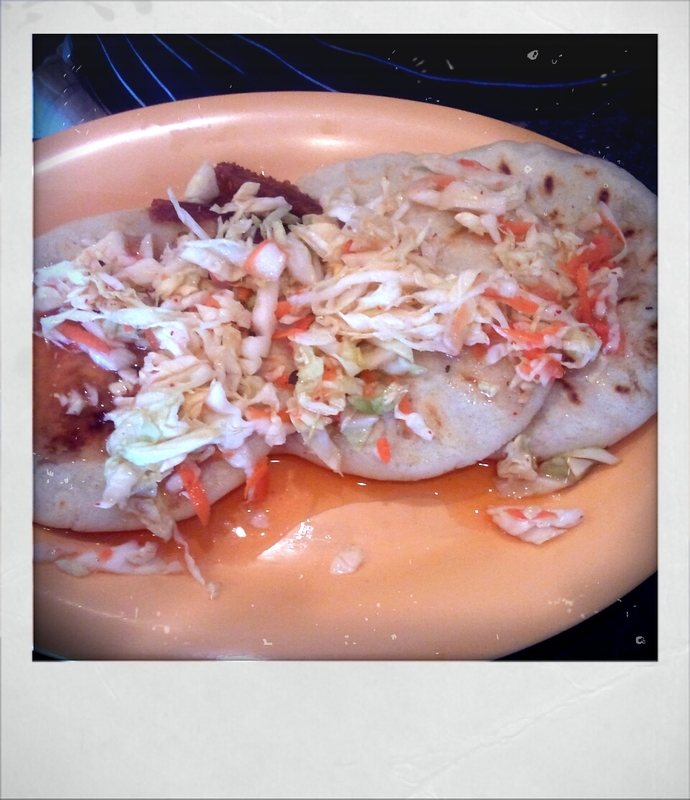 Pupusas hail from El Salvador and were originally created by the Pipil tribe many centuries ago. It wasn’t until the 1980’s that they arrived here in el norte, carried in the hearts and stomachs of thousands of Salvadorans fleeing their tumultuous & civil war torn country. Since then, pupusarias have popped up all over the U.S. and are especially prevalent in LA, where this little gem resides. Mi Carbonero Restaurant is similar to a lot of Latino owned restaurants around LA; every possible window surface is covered with flashy photo evidence of just how good their food looks, complete with a poster of international phone cards they also sell. You know, just in case you desperately need a phone card with lunch. 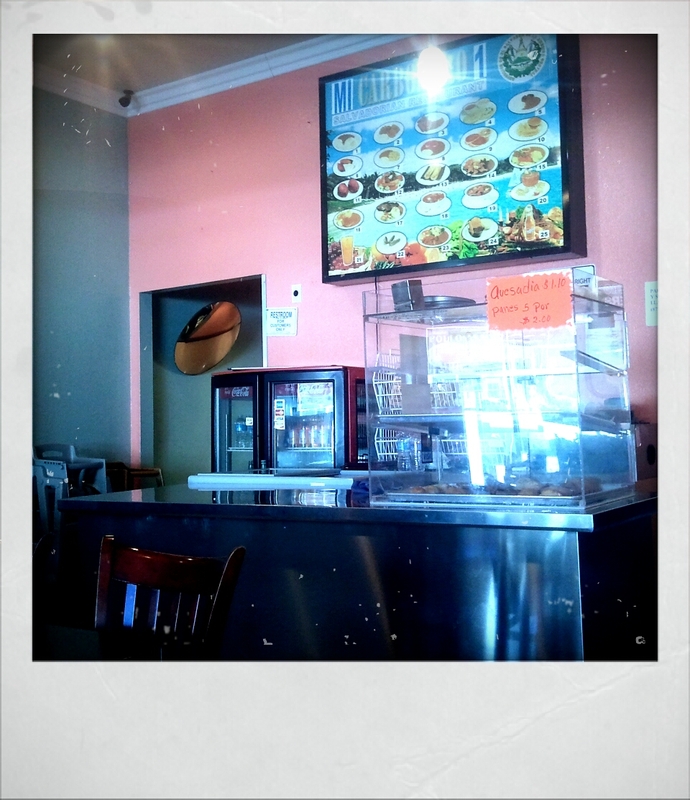 The interior of Mi Carbonero is pleasantly cool, a dining requirement in the often stifling LA valley, where the temperatures can reach into the 90’s for days on end. Pupusas are essentially stuffed tortillas, filled with all sorts of delectable combinations; my favorite being the tried & true Queso con Frijoles. That’s cheese and beans for my gringo friends. Once the pupusas are delivered to your table, you’ll get the traditional accompaniments, a cabbage slaw otherwise known as curtido and a tomato sauce. Now for all my pupusa eating novices out there, these two garnishes are as important to a great tasting pupusa as the pupusa itself and I dare anyone to argue otherwise. To find a pupuseria which produces both equally well is a perfect trinity, a trifecta of taste bud excellence and let me tell you, it can be damned hard to find. So I was pleasantly surprised when Mi Carbonero delivered just that. 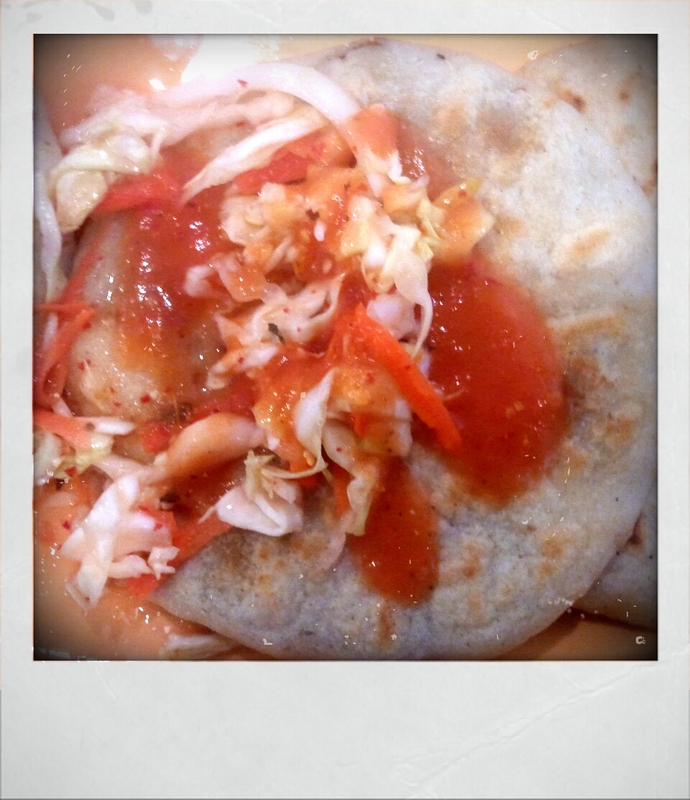 A tiny place in the sea of humanity that is LA, and I had found pupusa perfection. Now, if only I didn’t live 3 states away….